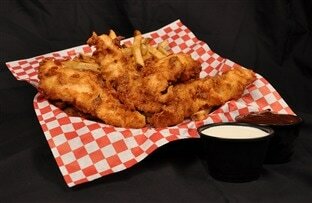 Golden fried breast meat, cut & breaded in house to order. Served with fries & a side of ranch. 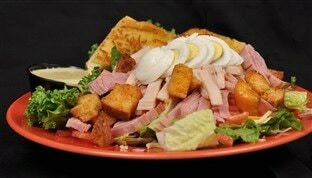 Romaine topped with turkey, ham, tomatoes, hardboiled egg, croutons & three cheeses. Choice of dressing. Served with garlic bread. Your choice of pepperoni, sausage, salami or Canadian bacon with 3 cheeses, mushrooms, olives, onions, marinara, & ricotta cheese. 3 cheeses, marinara sauce, mushrooms, olives, onions, artichoke hearts, green peppers, marinara, & ricotta cheese. This one has pepperoni, spicy Italian sausage, salami, Canadian bacon, 3 cheeses, onions, mushrooms, black olives, marinara, & ricotta cheese. Ranch, Blue Cheese, Italian, Sesame Seed, Thousand Island, Caesar, Honey Mustard or Balsamic. 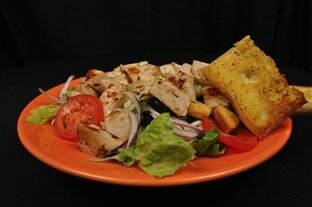 Strips of chicken breast tossed with romaine, tomatoes, red onions, olives, croutons, 3 cheeses & mushrooms. Toasted sesame seed dressing on the side. Served with garlic bread. 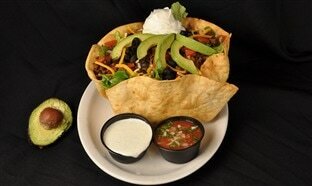 Our housemade shell filled with tender breast of chicken or seasoned ground beef, romaine, refried beans, tomatoes, green onions, black olives, cheddar & Jack cheeses, sour cream, & slices of avocado & salsa. Choice of dressing on the side. Romaine, crispy, spicy Buffalo chicken breast, tomatoes, celery & blue cheese crumbles. Blue cheese dressing on the side. Served with garlic bread. Crisp romaine, artichoke hearts, tomatoes, mushrooms, red onions, olives, cheddar & Jack cheeses & croutons. Served with garlic bread. Choice of dressing. Chicken romaine, croutons, & imported parmesan cheese shavings, tossed in our house Caesar. Served with garlic bread.